The Battle of Stalingrad was one of the turning points of the war in Europe and with casualties above 1.5 million, arguably the bloodiest battle in all of human history. One of the most heavily contested sites within Stalingrad was Mamayev Kurgan, a hill overlooking the city. 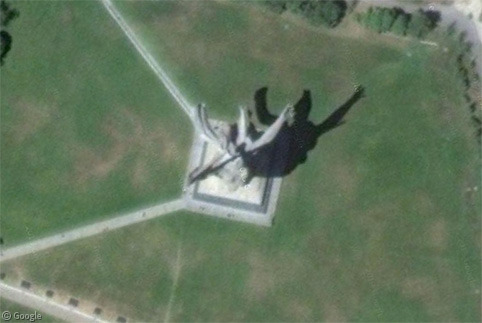 It is here where the USSR dedicated a memorial to the Soviet victory, the centrepiece of which is an absolutely enormous statue – “The Motherland Calls!” (“Rodina Mat’ Zovyot!”), which at the time of its dedication in 1967 was the largest sculpture in the world. Since then Stalingrad, USSR, has become Volgograd, Russia, but this monumental memorial still dominates the skyline. The 52 metre figure is made of concrete, and her 33 metre sword is stainless-steel, making the sculpture 85 metres from tip to toe (not including the plinth, which adds another 16 metres). Here’s a ground-level shot which you absolutely have to see to believe! The Motherland Calls! was designed by Yevgeny Vuchetich (who also designed Berlin’s Soviet War Memorial) and she was erected as part of a series of sculptures commemorating the Soviet victory in the Eastern Front of World War II (another of which, Kiev’s Mother Motherland, we’ve previously featured1). This massive engineering task was orchestrated by Nikolai Nikitin who was also responsible for the previously featured Moscow State University, Warsaw Palace of Culture and Science and Ostankino Tower – which are all ridiculously enormous too! 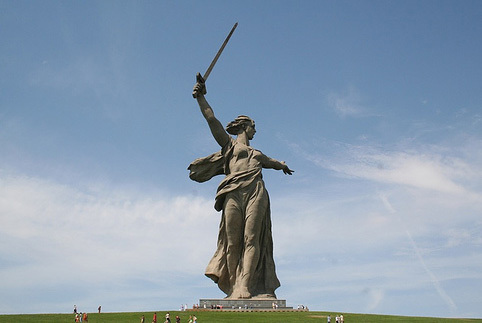 More info about the Battle of Stalingrad, Volgograd, Mamayev Kurgan and The Motherland Calls!, as always, at Wikipedia. Or check out a tour of Mamayev Kurgan at the official site (in English). I dunno, but it sure zigzags for a long way! Stays the same width, too. Maybe some kind of aqueduct? The green planting looks to be urban forestation / delimitation of new development / green belt type of thing, but I wouldn’t swear by it! That picture was my desktop-background for months! Stumbled upon it thanks to link in a previous post on this site. Another gigantic war memorial statue can be found in Murmansk: View Placemark I found a picture of it here. It’s a statue of a soldier looking west, where the Germans were coming from. I don’t know how high it is but I do remember it was pretty big. 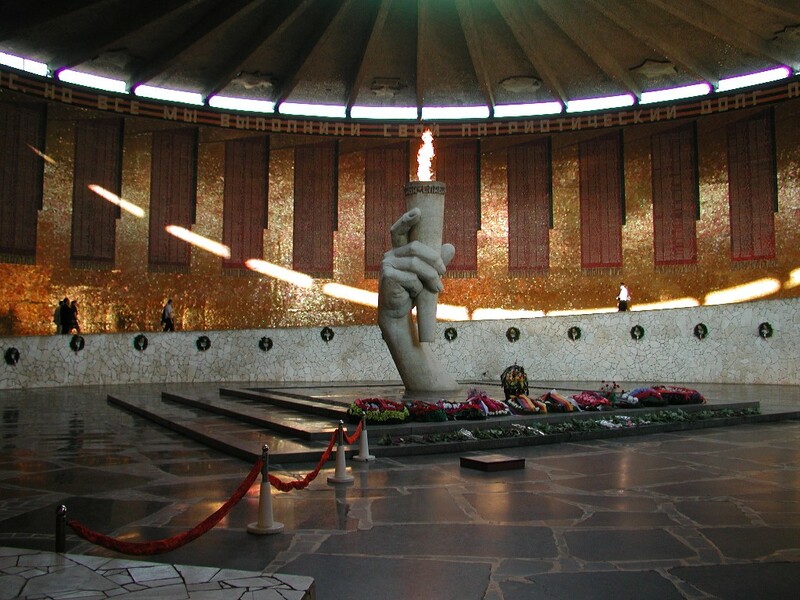 that statue is awesome…..only word for it. I would love to see a picture of it with the full moon rising behind it.